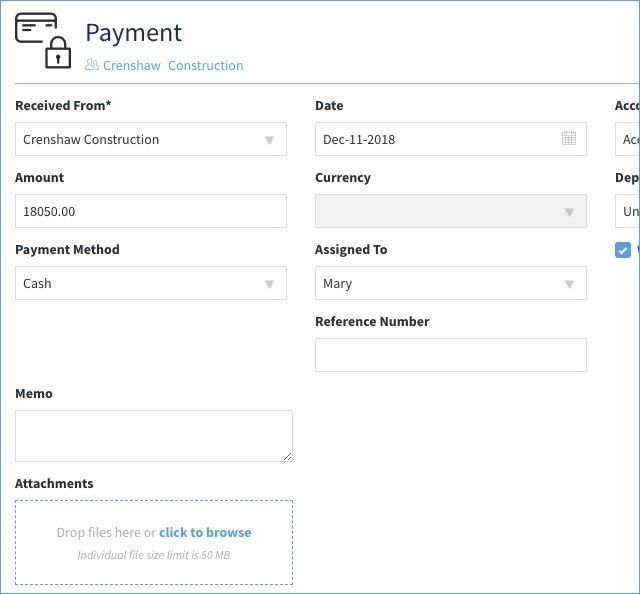 Method's Payment App is used to log a payment, which saves a record of the received payment and updates invoices in Method and QuickBooks. The app can also process payments made via payment gateways (e.g. credit card payments). The following sections will show you how to do both. Note: Processing a payment requires you to log it as well. The following steps will show you how to accomplish all three of these goals. 1. From your Method dashboard, click ⊕ New on your Payments App, or click ⊕ New Payment from your Payment List screen. 2. This opens your New/Edit Payment screen. Choose the customer from whom you're receiving the payment. Amount: By default, this is pre-filled with the customer's total outstanding balance but can be changed. Note: You cannot associate a payment with a customer carrying a negative balance. Payment Method: Select a method of payment from the dropdown. Further down on the page, you can process the payment as well. Date: shows today's date by default, but can be changed. You can set a future date, but make sure you check “Waiting for sync approval” so QuickBooks doesn’t update the customer's invoices. Currency: For multi-currency accounts, you can select the currency the payment is in. Assigned To: Assign the payment to a Method User. Reference Number: If no reference number is entered, Method will assign one sequentially (if the last payment was 15, this will be 16). Memo: Internal note to you or another Method user. Attachments: Allows you to attach a file to this payment. This file is only accessible from this payment screen. Accounts Receivable: The accounts showing in this dropdown are populated by QuickBooks, but does not appear for QuickBooks Online users. Deposit To Account: The account where money is initially deposited. The accounts showing in the dropdown are populated by QuickBooks. Waiting for sync approval: Postpone the Method sync. 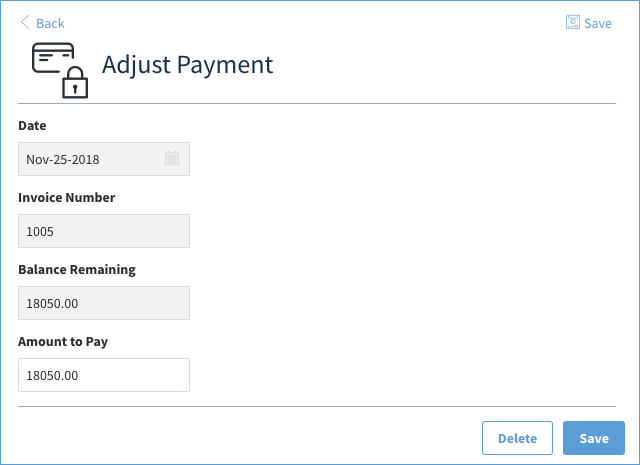 Your payment is accepted, but invoices are not updated in your QuickBooks account until this is unchecked. Tags: Assign tags to this invoice. If the payment does not match a specific balance, it is applied to the oldest outstanding invoice for this customer. If the payment pays off an invoice with extra left over, the extra is applied to the next-oldest invoice. If the payment does not pay off the entire invoice, the payment is deducted from the customer's balance. 6. If you uncheck Auto Apply Payments, you are prompted to choose an invoice (or invoices) to apply this payment to. 7. Click ⊕ Select Invoices to Pay". This will bring you to a new screen. 8. Select one or more outstanding invoices from the list by checking the checkbox. 9. Click “Add Selected Invoices”. 10. 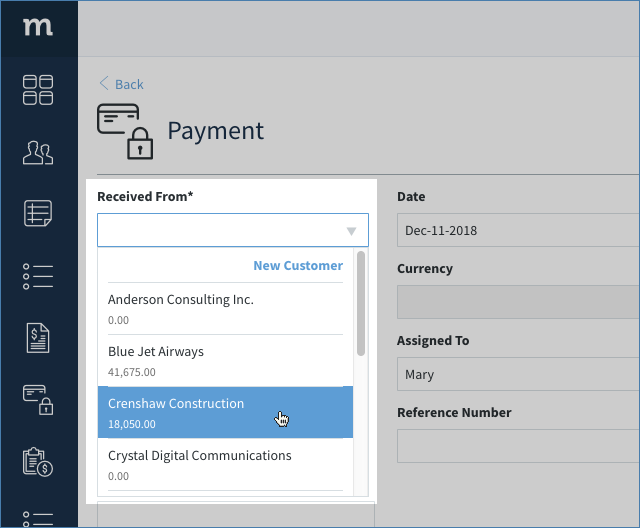 You are returned to the New/Edit Payment screen, and now the invoice list is populated with the invoices you selected. 11. 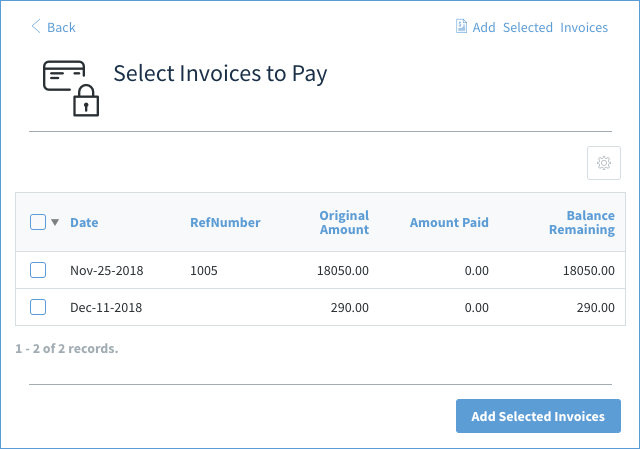 If you select an invoice in the grid, you can Adjust the Payment. This brings you to a new screen so you can alter the amount to pay. 12. If you want to process the payment at the same time it's logged, please see Process a payment below. Note: Leaving this option unchecked means Method assumes the payment has already been received. 15. Click Save to save the payment. Your payment is now visible in the Payments List. 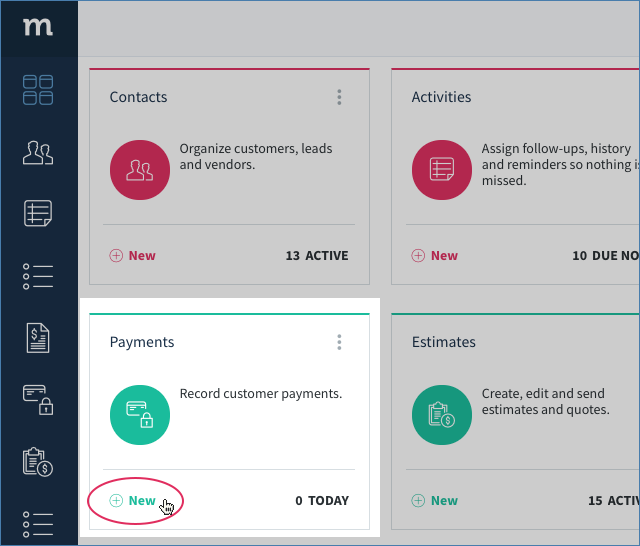 Any payment processed is subtracted from the customer’s outstanding balance in QuickBooks during the next sync, and their balance in Method is also updated. Note: In order to process a payment in the Payment App, you must have previously set up your payment gateways. To learn how, click here. 1. Follow steps 1-12 above. 2. 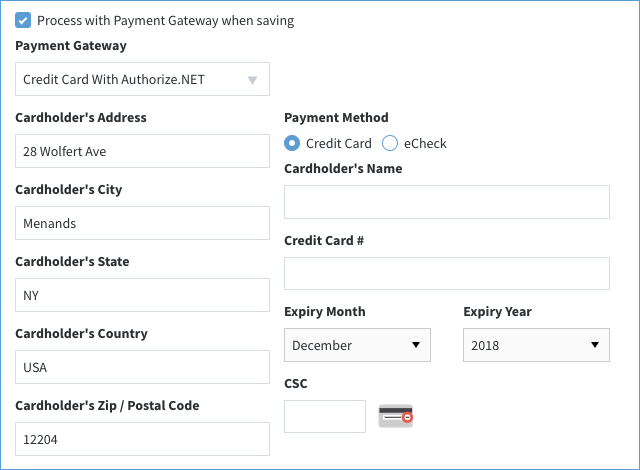 Click Process with gateway when saving and choose your gateway from the dropdown. Note: Only gateways that have been previously set up will appear in this dropdown. 3. Fill in the customer's credit card number, expiry date and verification code. Their name, address and zip may be auto-filled. Note: Method does not save credit card information. 4. Click Save to save the payment. The payment is saved to Method as above and will update records in QuickBooks during the sync. The payment has also been processed via your chosen payment gateway.